ROME - The convening of baseball’s leaders in the Executive Hall of the Italian National Olympic Committee (CONI) brought about a serious and productive discussion about the groundwork of the new governing body of baseball and softball, the World Baseball Softball Confederation (WBSC), and the campaign being waged to include baseball/softball on the 2020 Olympic Programme. 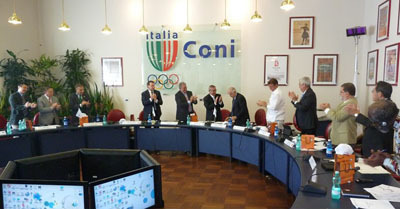 The meeting was hosted by CONI, whose Secretary General Roberto Fabbricini was present for the opening remarks. Fabbricini sat as IBAF Executive Director from 2010-2012 and was honored by the baseball leaders for his guidance and leadership in the service to international baseball. The status and progress of the new international federation, the WBSC, was reported on, with unanimous support and praise of the significant groundwork done, and of the future steps to be taken, by the WBSC Executive Board, which is being led by co-President’s Riccardo Fraccari and Don Porter. “Our sport is easy to learn, easy to teach and can be played and watched anywhere, and furthermore, it would diversify the Olympic Programme’s portfolio, as there is no such category of sport already existing in the Games. There is running, throwing, batting, catching, teamwork---it’s an active, non-contact, social, sport,” Fraccari told the baseball committee. Baseball/Softball are one of three additional candidates in consideration to supplement to the 2020 Olympic Programme.